Cordials emerged out of Renaissance Europe during the refinement of distillation. The word cordial originates from 14th century French meaning ‘of the heart’ and from Medieval Latin “cordialis” meaning of or for the heart. An alcoholic maceration of herbs and spices, cordials were popular medicinal panaceas used to “invigorate and revitalize”. Today, cordials can be enjoyed as delicious beverages, as health aids, and for other incredible uses. They can be added to marinades and jams. Some people have used cordials in the carmelization process when roasting vegetables; and let’s not forget that these fabulous beverages can be used to make popsicles. The possibilities are only limited by the imagination and the desire to experiment. 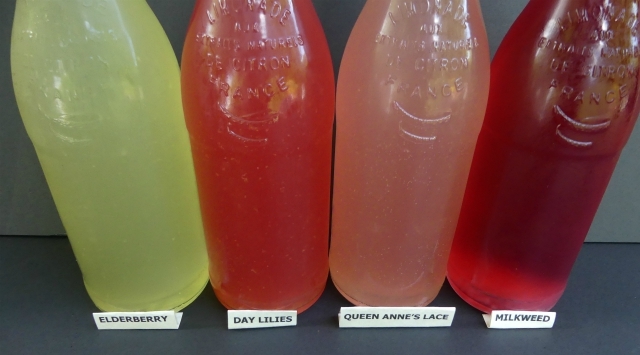 Capturing the taste of summer by making your own cordial is becoming a fast-growing favourite by many individuals. Cordials are easy to make and much healthier than most fruit juices. These beverages are simply a mix of (consumable) flowers or fruit, sugar, water, lemon slices and citric acid. All you need are sterilized mason jars and bottles. Cordials will keep in a cool, dark place for up to a month or in the fridge for slightly longer. Make sure your cordial is stored correctly or it can start to ferment. Freezing your cordial is an option if you want to keep it for longer. Making cordials is a great way to capture the essence of fragrant flowers that are in season that you enjoy. Perhaps one of the most popular cordial flavours is the elderflower. Using in-season berries instead of flowers is an option as well. Raspberries, strawberries, and blackberries all work well. Be sure to experiment with the wild grapes and autumn olives as well. There are some “potent” fragrances that can be used but it is recommended to use a lot less flowers in the infusion. Bee balm, sweet white clover and marigolds fall into this category. Cordial making isn’t always about using what flowers are in season. Using herbs can produce a great cordial as well. When preparing an herbal cordial follow the basic recipe below and use about a ½ cup dried or 1 cup fresh herb of your choice. Using fresh lemon balm or lovage leaves may be a taste you want to try. Depending on the flower or herb you use will determine the health benefits of a cordial. For example, an elderflower cordial contains a concentrated form of constituents which are valued as a general tonic due to its high vitamin C content. It is rather simple to make a cordial. All the equipment you’ll need is to have sterilized 1 litre (or 1 quart) mason jars and either a strainer or cheesecloth for straining. Boil water and pour into a mason jar about half way. Add sugar and stir until sugar is totally dissolved. Add cold water but be sure to leave about 2” from the top. Let cool. Add citric acid or vinegar and stir. Then add 4 to 6 thin slices of fresh cut lemon. Add flowers (or herbs) and push them into the liquid. Place jar on a kitchen counter not in direct sunlight. Place (do NOT tighten) a lid on the mason jar. Let sit 3 to 4 days and if desired, stir daily. After 4 days strain the mixture. Place your cordial in a jar with a lid and store in the fridge. For a milkweed cordial recipe click here. Make lots of cordial and be sure to freeze some of your favourite to enjoy for months to come. This is a great gift idea for the person that has everything, or for the person that truly appreciates a homemade gift. Have fun and be sure to leave comments about your adventures in cordial making! Black currant leaf makes delicious drink. Thank you – this is the best! You are the best forager out there! Oh my – – thank you for those kind words!